Also known as a Diving Chamber, a Hyperbaric chamber is a pressure vessel used to treat patients, including divers, suffering from certain diving disorders such as decompression sickness, Air embolism, severe carbon monoxide poisoning and a number of other conditions. The word ‘hyperbaric’ is derived from the Greek words ‘hyper’ (υπερ) for above normal and ‘baros’ (βάρος) for weight. Once sealed, an operator can control the atmospheric pressure inside the chamber. This means the pressure conditions a diver experiences at varying depths in the water can be simulated. 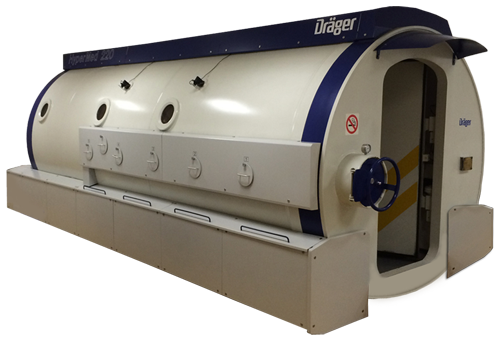 Often the terms diving chamber, recompression chamber, decompression chamber, hyperbaric chamber, and hyperbaric oxygen therapy chamber are used interchangeably. The names reflect the different purposes that the chambers are designed for, rather than their capability. A decompression chamber, recompression chamber or diving chamber would be used to treat divers suffering from the Bends. 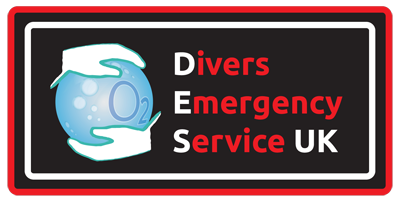 Or in the context of surface supplied diving, to allow the divers to complete their decompression schedule at the end of a dive on the surface rather than underwater. 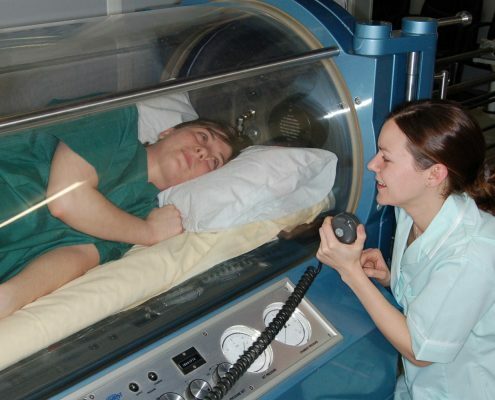 A hyperbaric oxygen therapy chamber would normally used in a clinical setting (eg within a hospital or sports clinic). Treating patients whose condition might benefit from hyperbaric oxygen therapy (HBOT), including divers. For less seriously ill divers, the more common monoplace (single occupancy) chamber is often used, especially if it is the only one available. Multiplace chambers are capable of admitting more than one person (patients and In-chamber attendants), the largest of which can accommodate up to 10 – 12 persons at one time. Oxygen forms about 21% of the air we breathe. When medical treatments require us to breathe a higher percentage of oxygen, an oxygen mask would commonly be used. In some situations, it may be necessary to give even more oxygen than can be delivered by ordinary masks. What is Hyperbaric Oxygenation (HBO) or Hyperbaric Oxygen Treatment/Therapy (HBOT)? Placing the patient in a hyperbaric chamber with a pressure greater than 1 atmosphere means more oxygen can be absorbed. This is Hyperbaric Oxygenation (HBO), commonly known as Hyperbaric Oxygen Therapy (HBOT). 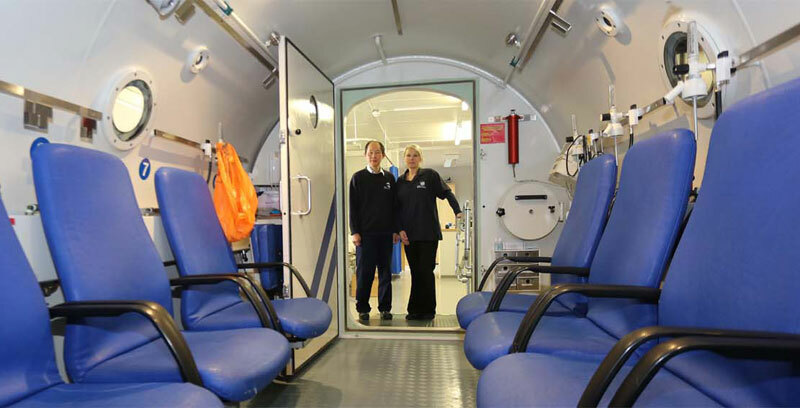 HBOT is used by the NHS to treat decompression illness; gas embolism; acute carbon monoxide (CO) poisoning. It is also a useful prime treatment and/or adjunct therapy for diabetic lower extremity ulcers; venous ulcers; crush injuries; grafts and flaps; necrotising soft tissue infections; osteoradionecrosis; cancers and tumour sensitisation to radiotherapy; orthopaedics; sudden deafness; thermal burns; acute ophthalmological ischaemia.